If you search for information on Google today, you may notice the results have a slightly new look. The world's dominant search engine on Wednesday announced some changes that it refers to as its "spring metamorphosis." "Today’s metamorphosis responds to the increasing richness of the web and the increasing power of search — revealing search tools on the left and updating the visual look and feel throughout," Google says in a blog post. "While we are constantly rolling out small changes and updates, today’s changes showcase the latest evolutions in our search technology, making it easier than ever to find exactly what you're looking for." Some changes are largely cosmetic: Navigation that was at the top of the page is now in a redesigned column on the left, for example. That column also lets searchers filter their results by category, potentially making it easier to shuffle from news stories to images and blog posts in the same search. MercuryNews.com also says the Google logo changed slightly, and that the search box is now larger. Here's some detailed analysis from the site Search Engine Land. Google still dominates the search world, with 70 percent of the market share, according to a March report from Hitwise, which monitors internet traffic. But it has come under threat lately from Facebook, which recently unveiled a plan to stretch into the rest of the internet, making it more social, and potentially taking away some of the power of Google's links; and from the growth of Bing, a rival search engine from Microsoft, which bills itself as more visual than Google. 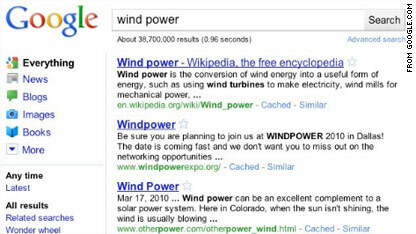 Bing has about 10 percent of the search market, Hitwise says. Check out Google's changes and let us know what you think. Is Google just trying to get attention for some cosmetic shifts? Or are these changes significant? Also note that even look-and-feel changes to search engines can be a big deal. When Bing, for example, darkened the shade of its blue links, the company reportedly earned an extra $80 million in annual revenue. 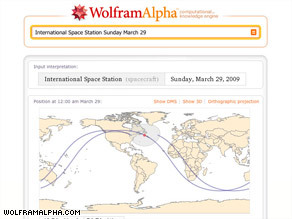 Wolfram|Alpha: a new way to find data online? There's been lots of buzz in the tech community about a site called Wolfram|Alpha, which is set to launch in about a week - likely on May 18, according to a spokesman. On first glance, Wolfram|Alpha looks like a search engine: it has a box where you type in a question or query terms. That's about where the similarities end, though, because, unlike Google or Ask, Wolfram|Alpha is kind of like an enormous calculator. It takes your question and crunches out an entirely new answer, even if the answer isn't something that's been posted on the Web before. Confused? You're not alone. An example should help. Say you're an investor and you want to see how two companies are faring against each other on the market. You could type in "IBM versus Apple" and Wolfram|Alpha will generate graphs and tables to compare the stocks over time. It also give you the Web-based sources used to generate the data, so you know where the numbers are coming from. The site also solves equations and shows the steps it took to do so, which will be of interest to high school students and math majors. Not into number crunching? If you live near the coast, you could type in "tides in ____" and find charts of tidal and lunar information. You could also graph that against other cities, which would be cool if you're a surfer. The site is also interesting for academic queries. Type in "Internet users in Africa" and you'll get the total number of Web users there - 51 million - as well as lists of the number of users by country plus graphs of this information. If you're in the fisheries business, or if you're an environmentalist, you could type in "fish produced in Italy versus France" to get an idea of how that sector is faring. The answer includes specifics, like how much of the fish crop was farmed versus what was captured. Such data could be used to argue policy points or to debate whether or not certain industries are sustainable. Sound magical? Many people seem to think so. CNET and the New York Times have informative posts about the site and what it means for the way we generate and digest information in the Internet age. 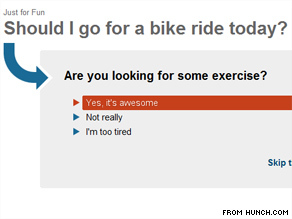 But it's worth noting that all of the above searches were pulled out as examples in a press video released by the site's founder, Stephen Wolfram, who also was the creator of Mathematica. CNN obtained a test version of the site before its official release, and other searches that seem like they would work often didn't when I tried them. I recently wrote a story about people who travel to dangerous parts of the world, so I searched for "countries with highest crime rates" and got no answer from the site. I tried a few variations and nothing seemed to work. "Country homicide rates" provided me to a link for the definition of a homicide, but that was about it. 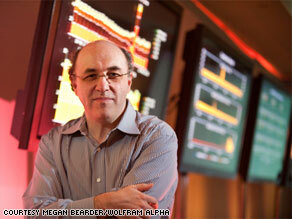 CNET, a CNN partner site, experienced similar troubles when it tested Wolfram|Alpha. In a video, CNET says about two-thirds of its test searches didn't turn up useful information. Think of Google as the Sears Roebuck of search — there are many "specialty" stores yet to be launched to meet different tastes and needs. But I don't think that Wolfram Alpha will be as widely used as Google is because it does not tap into a well-distributed, universal meme or structure as Google did; nor has the brilliant scientist figured out the architecture of participation — an easy to understand method for anyone with the desire and skill to help make Wolfram Alpha a better tool and knowledge base. If I want to help build Wolfram Alpha, I don't know how to begin; I do with Wikipedia. In a recent blog post, Google also says it has added a public-data search function. Still, it sounds like people are mostly excited about Wolfram|Alpha - in part because the project's aim is just so lofty. In a press-release video, Wolfram says the site aims to "compute whatever can be computed about the world." Read more from the site's blog.